Photographers on the Gorge Trail in Watkins Glen State Park during the Watkins Glen Gorge Photowalk on Sunday, June 24, 2012. Nikon D700/28-300VR, 1/60s, f/8, ISO 1100, EV 0, 35mm focal length. Yesterday I attended a photowalk lead by upstate New York landscape photographer A. D. Wheeler at Watkins Glen State Park in Watkins Glen, New York. Fellow bloggers Barb of The Aspiring Photographer, Debbie of My Life in CNY and Dave of FLX Photo also attended. Not only did visitors to the park have to deal with the normal tourists, they had to put up with two dozen tripod using photographers. Not to worry, we had a great time with all the visitors, talked shop with people of like minds and made new friends and connections as we walked the spectacular Gorge Trail in the park. 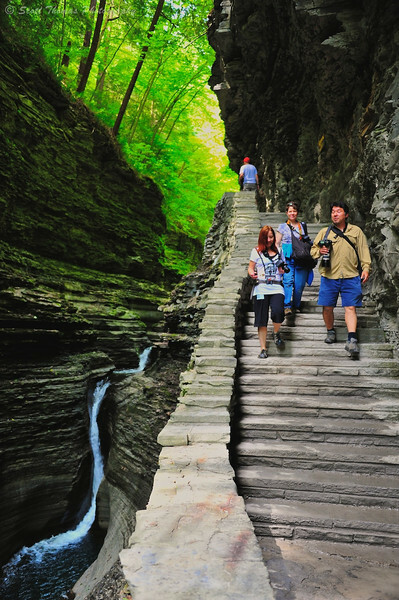 This entry was posted in Weekly View and tagged 28-300mm, a. d. wheeler, foliage, green, moss, new york, nikon D700, Photographers, photowalk, stairs, stone, vr, water, waterfall, watkins glen. Bookmark the permalink.